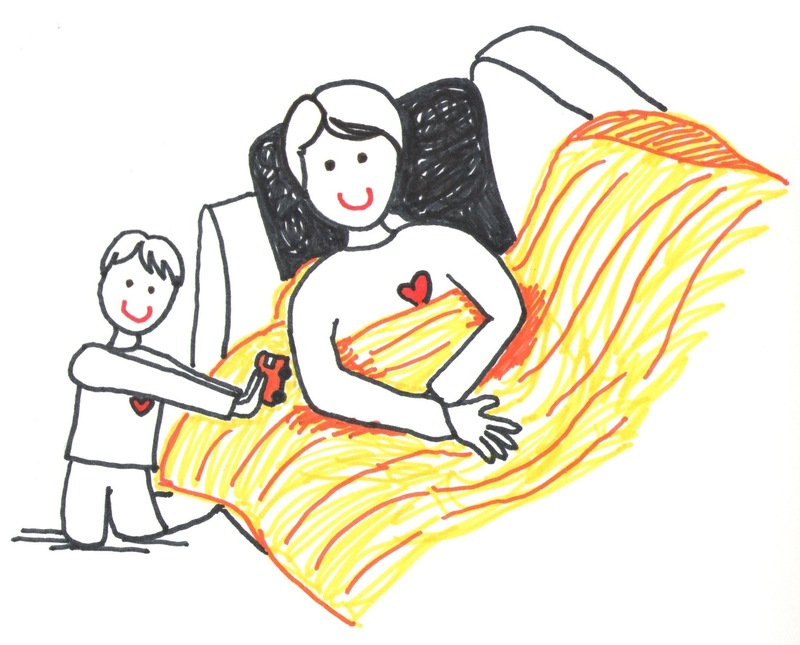 When a parent gets sick, life goes on. Kids have to get up and get ready for school. Lunches must be packed. Homework has to get accomplished. It can be a real struggle for moms and dads to get through the day when they have come down with the flu. Harder still, parents go through major life transitions such as beginning a new job, losing a loved one, or struggling with depression. And parenting goes on. How can you deal with those times in a way that allows you to heal yourself and parent healthy children? And how can you avoid placing more burdens on your children than they can reasonably handle? There seems a fine line between asking your children for help and giving them adult responsibilities for which they are not ready. While I was sick over the past couple of weeks, I reflected on this topic and how I might channel the little energy I had in the direction of healing and being a responsive parent without doing more than I could handle. “I’ll help you feel better,” said E. However, he grew moodier and at times, angry. Children often become angry, upset and worried when a primary caregiver is sick. Their own sense of safety and stability is shaken. 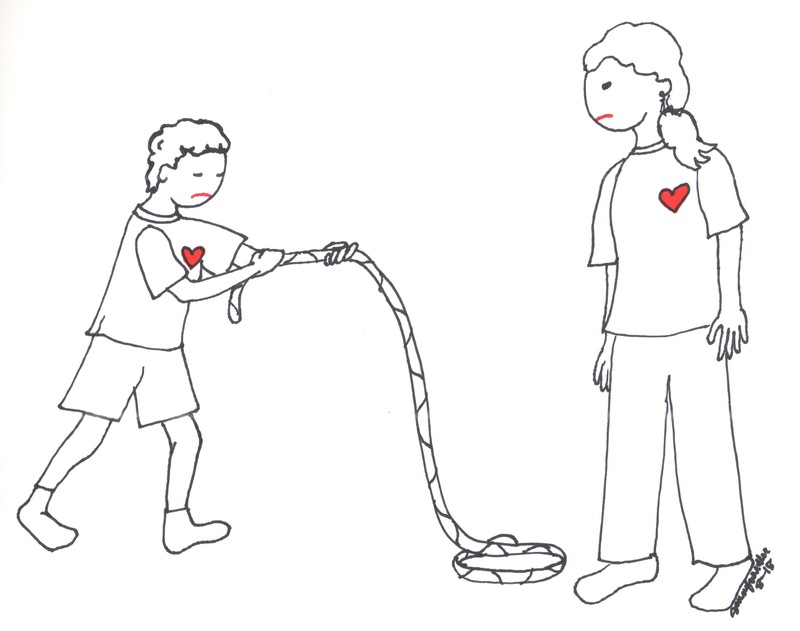 They wonder, “Is she going to be able to take care of me and my needs?” and “Is this going to go on forever?” Children are acutely aware that their very survival depends upon their parents despite their desires for independence. So in addition to dealing with your own problems and lack of energy, you also are likely to encounter a child who is not at his or her best. Here are some thoughts about what you might do in these circumstances. Communicate with all family members what you are able to give and what you are unable to give. Set clear expectations so that they know in advance what you are unable to do. For most of us, this is incredibly challenging since it feels like admitting a weakness. However, it is a strength to be self-aware and understand your limitations. Communicating with them will allow your family members to support you in the ways that are needed. Model this for your children and they will learn how to become more self-aware and ask for help when it’s necessary. Acknowledge that the problem is time-limited. Children often feel as if the current situation will last forever. It helps to assure them that temporary adjustments need to be made while you are recovering. 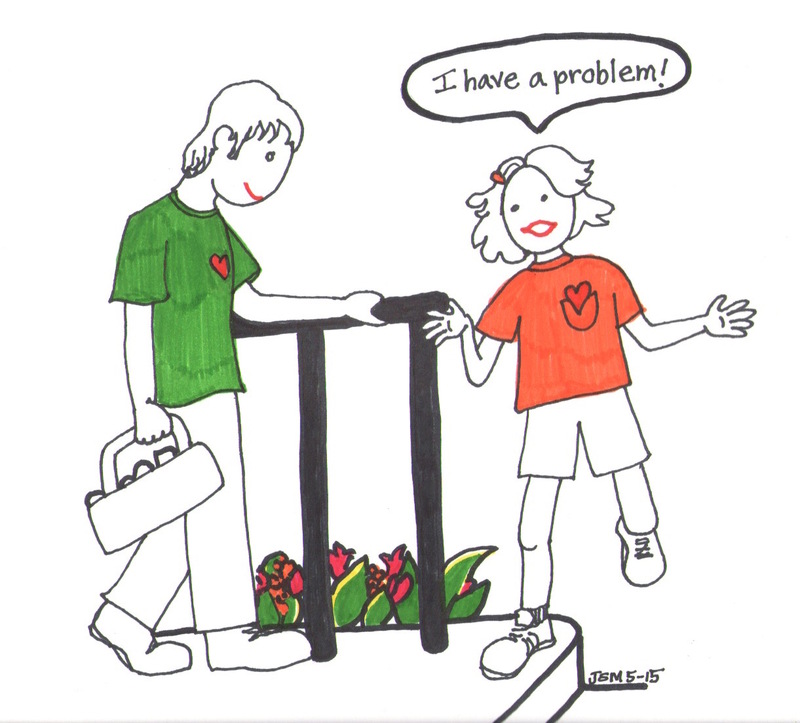 Ask for help or simply accept help when offered from other adults around you. This too can be a real challenge. However, asking your child for emotional or physical support for which they are too young crosses a critical boundary line and can create tremendous anxiety for a child and in turn, you. Create mutually supportive adult relationships and look for chances to help friends and family when they are sick or in a crisis. We all can have those relationships if we are the first to give and reach out when others are in crisis. Reach out to others and they will likely be at the ready to support you when you most need it. Stick by your child’s routine. Being consistent with your daily routines will provide a greater sense of security for your child. They will still likely feel uneasy that you are not doing well. However, they will relish in the comfort of your typical routines. Understand and empathize with your child’s emotions. Realize that your child is likely to become angrier, needier, sadder and generally more upset when you are sick or stressed. If you meet their anger with anger, it will only escalate the problem. Instead, engage them with the understanding that all family members need to be gentle with one another and forgiving as one member attempts to heal. Release yourself from extraneous commitments. During the normal course of the week, we likely have enough commitments to fill our calendars with little time to spare. Ask for understanding from those commitments and minimize what you are responsible for so that you can focus on healing. Gain time later as you invest now in your health. Set clear, non-negotiable emotional boundaries. If your burdens are partially emotional, be certain that you are only sharing them with appropriate adults in your life. Your children are unable to shoulder your emotional problems though they will try because they love you. Don’t put them in that position. When you are tempted to talk with them about your troubles, remember that there is a critical boundary line. You remain the adult to allow them their childhood. The book Chained to the Desk; A Guidebook for Workaholics, Their Partners, and Children and the Clinicians Who Treat Them talks about the adult consequences of parents who required children to share in their emotional challenges. For those individuals, it can be a life-long struggle of never measuring up, high anxiety in trying to serve others’ needs and not being able to ask for support or help. Allow your partners, friends or a counselor to provide that adult support to ensure you are getting your needs met and are not tempted to unload your worries on your child. If it’s a life transition you are facing, raise your awareness of what you can expect emotionally. The book, Transition; Making Sense of Life’s Changes by William Bridges explains that in each transition (whether it’s perceived socially as positive like the birth of a child or negative like being fired from a job), there is a death which requires letting go (and the sadness that goes with it). There is a state of limbo, an in-between period in which, like the caterpillar in the chrysalis that turns to “goo,” one must release the past and embrace the unknown of the present and future. And finally, the birth of the next phase of who you are becoming. Each phase of a transition produces a bundle of emotions. Raising your awareness about what you can expect will help you deal with them and allow you greater self-compassion. …being kind and understanding to oneself in instances of suffering or perceived inadequacy. It also involves a sense of common humanity, recognizing that pain and failure are unavoidable aspects of the shared human experience. Finally, self-compassion entails balanced awareness of one’s emotions—the ability to face (rather than avoid) painful thoughts and feelings, but without exaggeration, drama or self-pity. Her research supports the theory that mental health and a healthy self-concept are dependent on self-compassion. All of these recommendations are easier said than done. However, as I strive to become the best version of myself through continued learning, I strive for my own optimal mental health in order to raise a confident kid. I wish for you gentleness and healing as you do the same. 1 Robinson, B.E. (1998). Chained to the Desk; A Guidebook for Workaholics, their Partners and Children, and the Clinicians who Treat Them. (3rd Ed.) NY: New York University Press. 2 Bridges, W. (2004). Transitions; Making Sense of Life’s Changes. (2nd Ed.) Cambridge, MA: Da Capo Press. 3 Neff, K.D., Rude, S.S., & Kirkpatrick, K.L. (2007). An examination of self-compassion in relation to positive psychological functioning and personality traits. Journal of Research in Personality. 41 (2007) 908–916. Originally published on April 10, 2014. “Thank you for what I am about to learn,” or “Arigato gozaimasu” (ah-ree-gah-toe go-zah-ee-mass) my son along with ten of his teammates respectfully utter with a bow and prayer hands as they begin a lesson in Aikido. As a Star Wars’ fan and appreciator of “the force,” Aikido seemed to align well with my eleven-year-old’s desire to learn how to use his body, mind, and spirit powerfully and peacefully. When he came home and asked me if he could try out his new move called “Heaven and Earth” on me and I was taken down shockingly, swiftly but safely to the ground, I thought it wise for me to learn more myself about this discipline. Now a year into learning this martial art, I’ve discovered some invaluable philosophical lessons from this peaceful form of body, mind, and spirit training that prepares individuals for retaining their power while being attacked. Power is an essential human need for both parents and kids alike. 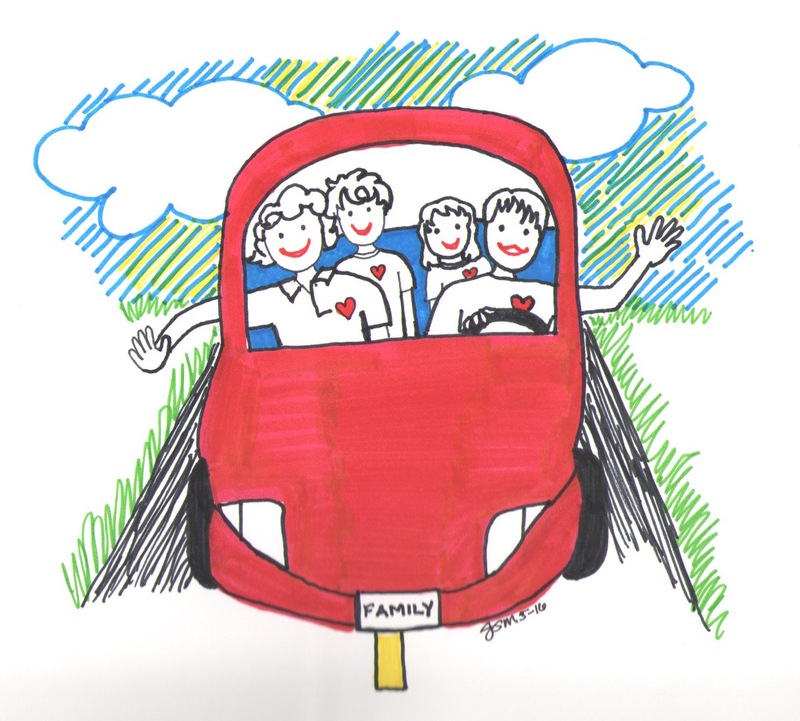 And how we think about, use, plan for, and structure our power and also, how we share it with family members can determine whether we feel a sense of ongoing safety, respect, and trust. If children feel powerless in a situation, they’ll search out ways to regain it. And at times, because of their lack of experience, they will lash out at us. As parents, we will be attacked whether its by a tiny toddler’s fists or by tween-age words infused with angst, anger, and confusion. And it can put a caring adult to the test. Often when an attack catches us off-guard, our feelings may guide us into actions and reactions that will escalate the problem like yelling, dominating with words or body language, or grabbing. Fearing an attack will only lessen our power. 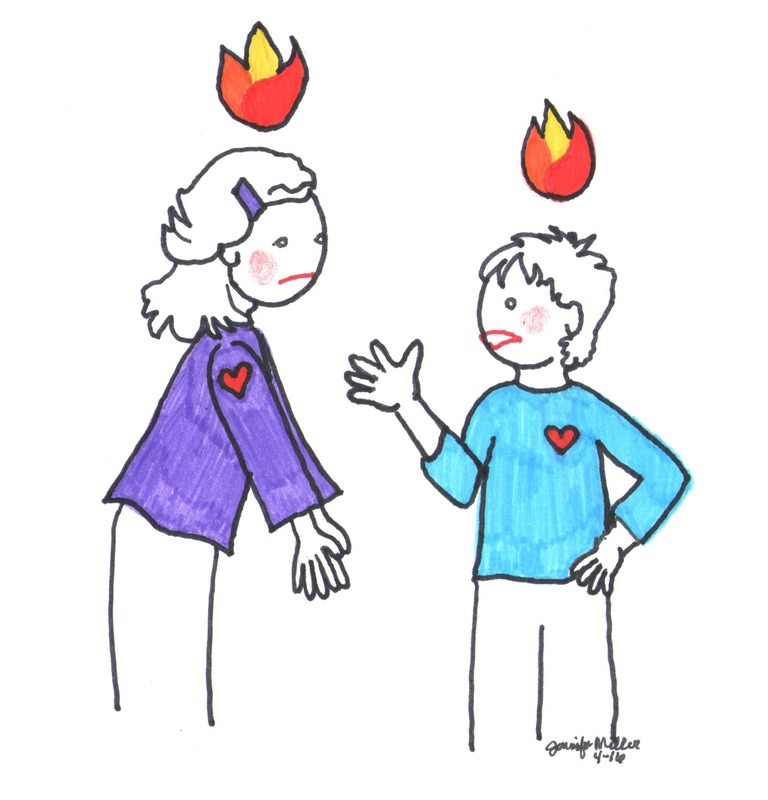 Greeting an attack with anger and loss of control will not model emotional intelligence for our child. So then, how can we teach our children and teenagers to seek power in positive ways? And in the case of the teachings of Aikido, how can we regain balanced power when it’s been challenged or thrown off balance? Check out these guiding Aikido principles and how we can learn to apply them as parents. Begin with a desire to harmonize. Master the “hanmi” position. Unbalance the attacker. In order to maintain power on both sides – both child and parent – we need to assume a stance that gives us power. Not running from house to car to grocery store, but if our child has started a fight, how can we assume a solid whole body position that helps us focus? Aikido teaches that our hips are the key to grounding our body without tension. How can you lower your center of gravity comfortably and widen your foot position? Aikido trainees stand with their body turned on an angle slightly with feet as wide as their hips to maximize comfort and stability. Try it and it may just help you focus on a constructive response. Aikido emphasizes practice so that you train your body to that position and it becomes effortless when you are attacked. How can you try it multiple times in low-risk situations so that you are ready when you are truly tense or fearful? 3. Use “Kokyu,” alertness but not tense while fully breathing. In order to bring your best self to a tense situation, how can your body and mind become fully ready and alert without tension? Breathing can help you achieve that stance by focusing on deliberate, calm yet powerful breaths. Your breathing through this moment when your child is attacking is critical in allowing you to respond in healthy ways. If you have tried meditation, this is a similar state. 3. Move in “awase,” or in synchronization. If your child engages in unsafe movements or choices, guide them to move away. Don’t talk or pull, just guide them and keeping moving. For example, toddlers like to run away from Mom or Dad thinking it’s funny. That running increases if Mom runs after toddler saying “No, No!” But if Mom turns away and moves calmly with the same amount of energy in the opposite direction, toddler with follow. (Yes, this has been tested. It works!!!) The same can be said for the aggressive energy of a first grader, a third grader, or a high schooler. How can we redirect that energy? “I’m going to that party!” yells your teenager after you’ve shared the rule of no unsupervised parties. 4. Use circular or spiral movements. Maybe you recall the movie, “Karate Kid” in which the main character was taught to “wax on, wax off,” his hand motions always moving in a circle to wax the car. To allow energy to circulate, movements need to be circular. Well, how might this apply in a parent-child situation, you ask? Good question! If there’s a verbal attack, how can you respond with a verbal circle? Here are a few examples. In Aikido, you’re taught to maximum effect for minimum effort. In order to exploit your own leverage in a moment of a child attack, use “strange calm.” Sit down, close your eyes, and just breath until you feel calm. Or use only a few words. “I need to calm down.” Again breathe. Then, address feelings not choices in a heated moment. To learn more about using logical consequences, check out the following tool on the parentingMontana.org site. 6. Place yourself in “atemi,” or at a correct distance. This is about being the correct distance from your child. If you leave the room, a child might get scared and feel like you are giving him or her the silent treatment (which is a form of aggression). Or if you are too close or even grabbing an arm to get him to go with you, you’ll also be emitting aggression. Because adults are physically bigger, we may be less sensitive to this issue and our child will be more sensitive to this issue. So how can you position yourself near your child but not in harm’s way or in a dominating way but at a safe distance? 7. Think “kiai,” or multiple attackers are the same as one attacker. Think of multiples attacking – or requiring your attention – as you might treat one. Calm and ground your whole body so that you can use your mind and spirit to fully focus on bringing your best self. Put your whole self into dealing with a child who is attempting to bait you into a power struggle. Stay alert, calm, and focused because the feeling or intent of the attacks may change and you have to be ready. 10. Use appreciative dialogue to close the disagreement. This is key. And how often do we miss this step in the busy-ness of life? Because Aikido training focuses on the body, mind, and spirit, the lessons of how to redirect an attack into shared power offer wise counsel for parents. Figuring out how to appropriately and in healthy ways share power with our children can become highly complex as they learn and develop. Using mindfulness to support our own sense of focused attention and calm during tense moments can provide the unique fortifying we require. But then, shifting that energy to regain balance and harmony requires some thoughtfulness. The strategies articulated above are derived from research-based strategies used with parents and teachers who want to raise confident kids and deal with power struggles in healthy ways. These strategies have the added bonus of serving as positive models for our children. So as we try out these constructive responses to conflicts, we’ll also be converting those tough times into teachable moments. Try out some of these in your own family life and see if you can end the day after a child has attempted to bait you feeling more caring, connected, and powerful. At the Academic Development Institute’s School Community Network, we believe all parents have dreams for their children and want the best for them. However, as parents ourselves, we also understand that everyday life can get a little overwhelming, and we all need some help and encouragement along the way. That’s why we continue to create resources, share research, and offer services to help families, school staff, and other caring adults connect and collaborate to support every student’s success. 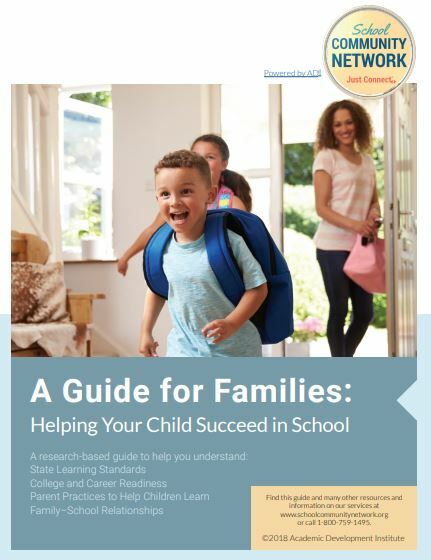 Recently, we posted a free booklet titled A Guide for Families: Helping Your Child Succeed in School.1 The guide offers free or low-cost ways to support your child’s academic, social, and emotional development at home, at school, and in the community. It includes information on state learning standards and school report cards, as well as college and career readiness. Throughout the guide, we also suggest questions you may want to ask of school personnel. We offer simple tips to help you model and build social and emotional competencies in each child in areas like conversations about everyday events, showing affection, and establishing a daily routine and family expectations. Research has shown that high parental expectations best predict school success.2 It turns out those little talks over the years as your kids grow matter more than anything else. 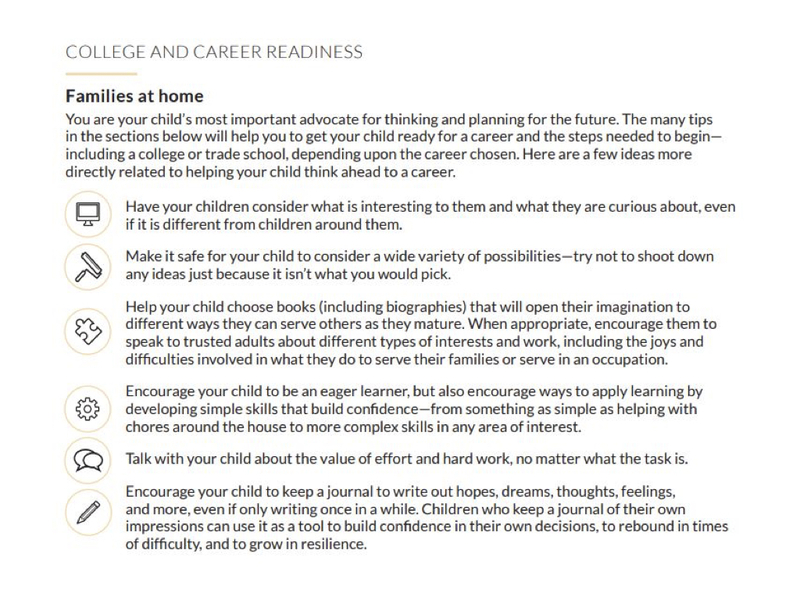 Finally, the Guide includes a section on supporting homework. Our tips can help your family establish good study habits that will set your child up for success in school now and in the future—and it all starts with you choosing a positive attitude about learning. As a parent, sometimes we need a little reminder about all the wonders there are to discover in the world and the privilege it is to learn about them. We invite you to download and share the Guide and the many other resources available at the School Community Network! 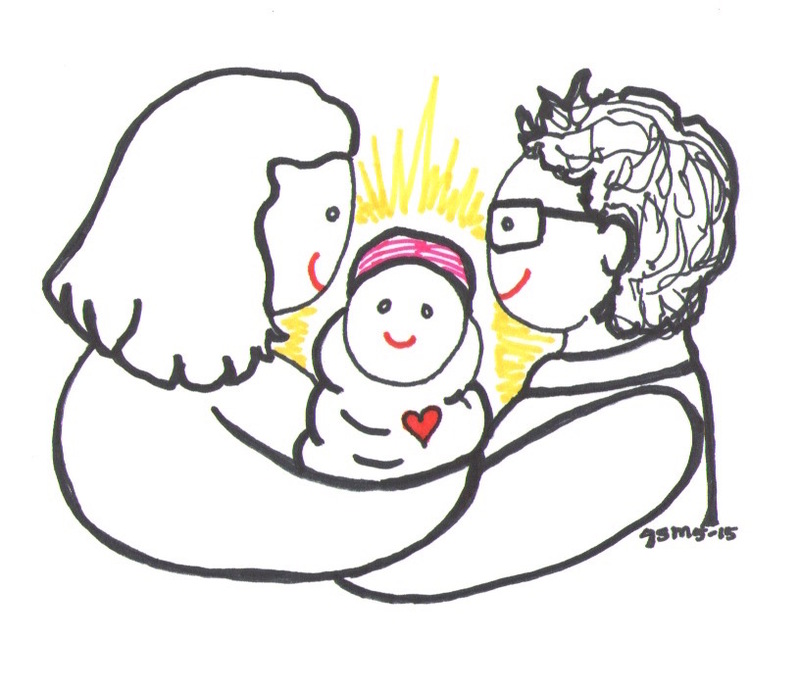 *CPCK Note: We are extremely grateful to Lori Thomas and the School Community Journal for reviewing and publishing our research on parenting and social and emotional learning and so appreciate their supports for families! 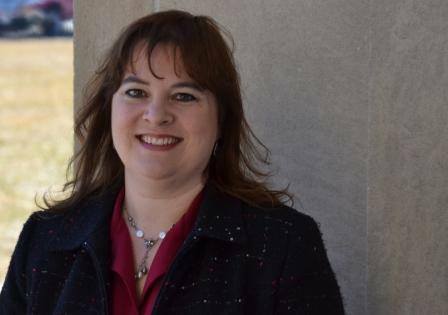 Lori G. Thomas is the Executive Editor of the School Community Journal and a Research Associate for the Academic Development Institute’s School Community Network. She is also a wife and mother of two, including a daughter with Prader-Willi Syndrome, and a grandmother of one. We tend to recognize the fact that babies need lots of loving touches. We hold them against our skin. We carry them next to our heart. We soothe them by gently smoothing their hair or massaging their tiny hands and feet. But as they grow, we may not consider how often we touch, how we touch, and the importance of touch. In fact, there’s research that shows that positive touch can have powerful effects and those findings have significant implications for family life. Touch can deepen intimacy in any relationship creating safety and trust and a sense of well-being. It offers health benefits as well. A study found that those who hugged more were more resistant to colds and other stress-induced illnesses. They found that the support felt particularly through caring touch helped boost immunity.1 Another study measured the brain activity of participants who were lying in an fMRI scanner anticipating a blast of loud white noise. Those who experienced it alone showed that the regions in the brain that are responsible for threat and stress were highly activated. But the participants who had their romantic partner alongside them stroking their arm didn’t show a threat or stress reaction at all.2 As we assist our kids in dealing with the day-to-day stressors of life, touch needs to be on our radar as a strategy that works. In previous generations, touch was limited since there were worries too much might spoil a child. My Mom recalls reading about the importance of touch and holding babies in the early 1970s when she was raising me while she feverishly read the only parenting guide available at that time, Dr. Spock’s “Common Sense Book of Baby and Child Care” that sold over 50 million copies. Her mother had been advised to keep her distance. And because my mother wasn’t held or touched much as a child, it felt unnatural to her as a Mom. Yet she knew it was important to me. So she made a daily hug a part of our routine. And I certainly benefitted from the love and closeness we maintain to this day. 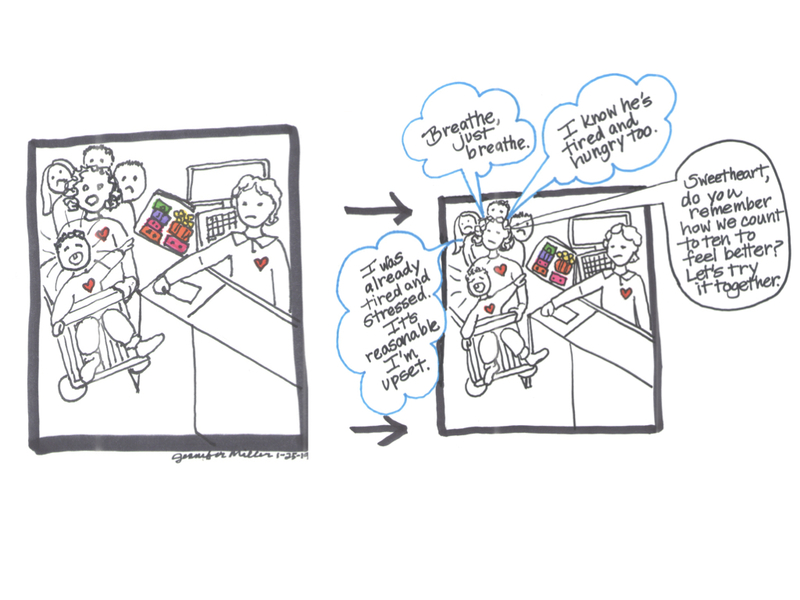 Teachers have long used touch as a way to redirect students who are daydreaming or off task. A simple touch on the shoulder can be enough to help a wandering mind focus on the present. Parents can use this as well. Instead of correcting a misstep your child knows she’s not supposed to be engaged in, try a shoulder touch instead and see if you might communicate through touch alone. Touch can also be a direct communicator of emotions. In fact, researchers tested this theory with an interesting experiment. They had a participant put his arm through a hole in a wall so that the other interacting participant could only see his arm. The one extending his arm was asked to communicate emotion only through his hand. And the other had to guess the emotion. Though there were gender differences (men interpreted men with greater accuracy and women interpreted women with greater accuracy), the guessed emotions for the same gender were up to 78% accurate.3 Can you tell what your partner or child is feeling just by touching his hand? It could be fun to try! Kindergartners need hugs just as much as third graders, eighth graders, and those tall Juniors in high school do. Here are some ways to incorporate loving touch into your daily family routine for the benefit of all. Create a routine time for hugs. Perhaps you already initiate hugs before you go off on your separate ways in the morning and before bed at night. Think about the routines throughout the day in which you see your family members – morning, after school, homework, sports practice, dinner, bedtime? 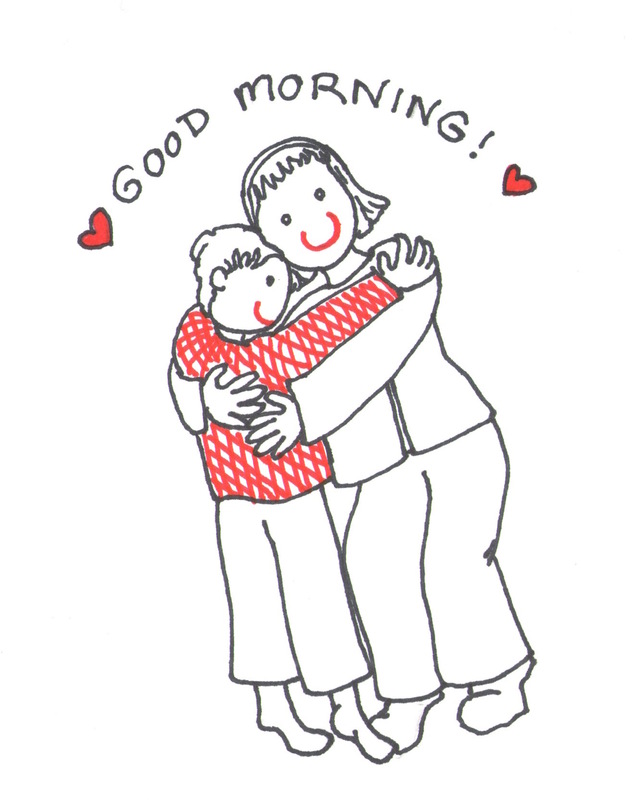 Begin inserting a regular hug into one or more of those times and it will become an expected part of your routine. I counted up my routine hugs with my son and we hug in each of the major transitions of the day. I know that benefits my well-being just as much as his. Try it! Find snuggle time. Instead of relegating yourselves to different chairs during movie watching time, why not snuggle together under one big blanket? Or snuggle while reading together before bedtime? It will set the tone for a good night’s sleep. Initiate a quick homework massage. Athletes get massages to work out their tired muscles and help them relax in between games. Homework can be a stressful time for kids. They may be anticipating challenges and can feel frustrated by difficult assignments. Giving a quick shoulder massage before or during homework time can help ease the tension and may even speed up homework completion! Reward with hugs instead of candy. So often we use candy in celebration. And though kids would never write down a hope for your love and attention on a holiday wish list, they appreciate it and benefit from it more than a box of candy. 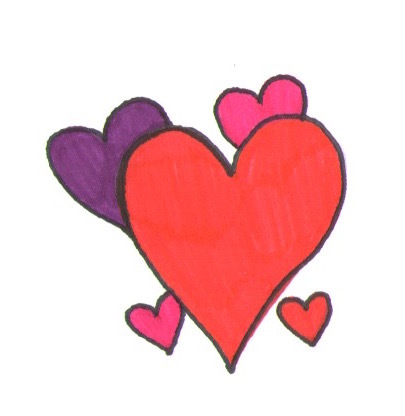 Shower your love with hugs when you are celebrating positive choices. Perhaps, use Valentine’s Day to kick off your very own hug campaign in your family to make sure you are getting your one-a-day despite family schedules. A snuggle before bedtime, a touch on the arm while playing, or a shoulder massage while getting through homework are all ways you use touch to promote trusting relationships and offer the benefits of well-being that come with it. 1. Cohen, S., Janicki-Deverts, D. Turner, R.B., Doyle, W.J. (2014). Does hugging provide stress-buffering social support? A study of susceptibility to upper respiratory infection and illness. Psychological Science, 26, 2, 135-147. 2. Hertenstein, M., & Keltner, D. et al. (2006). Touch communicates distinct emotions. American Psychological Association, 6, 3, 528-533. 3. Keltner, D. (2010). Hands on research: The science of touch. Retrieved on February 9, 2017 at http://greatergood.berkeley.edu/article/item/hands_on_research. Originally published on February 13, 2017. Research confirms that short breaks help a person’s brain refresh and process. Staring at the page may not produce any new thinking in your child and in fact, staying there when irritated can burn valuable fuel and decrease motivation to put in the hard work necessary to get through the learning process. But if he walks away, gets some fresh air, or moves a bit, he might feel differently. This small change of scenery can boost thinking skills in powerful ways. He can think more clearly and become a better problem-solver when he returns. He may even gain some new ideas or solutions to his problem removed from the work setting. This functions in the same way that we experience the “shower effect.” Do you get your best ideas in the shower too? Or perhaps your most creative thoughts come when you are driving in the car with no laptop or notepad at the ready? Or maybe when you’ve laid down to go to sleep for the night, your brain starts firing off brilliant thoughts. In order to access our top thinking skills, we require a mental rest. Consider that a short brain break for your child is working with their natural thinking processes to facilitate them, not fight against them. 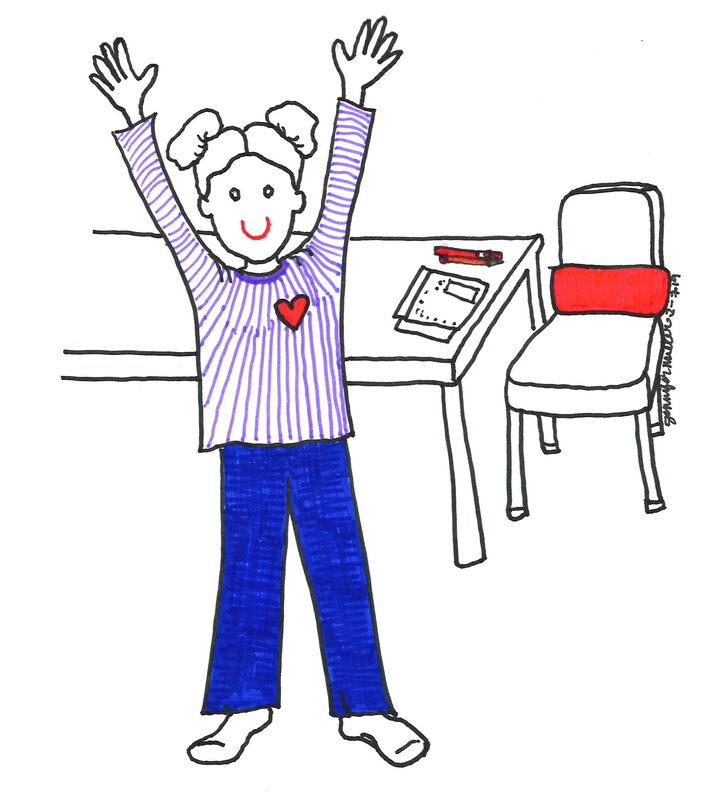 So although our intention to promote grit and “stick-to-attive-ness” in our children comes from a genuine hope to help them be successful, teaching and promoting brain breaks can help children learn to manage their emotions more effectively while working. And in addition, they may be able to extend their focused attention when they return to work with added motivation from the fuel they’ve gained. Here are some simple ways to teach, practice, and promote the essential brain break. Talk about the Brain Break during a regular (non-frustrating) homework time. Or if homework is consistently frustrating, then pick a non-homework time to talk about how to take brain breaks. See if you can come up with a few ideas together. What can your child do when taking a brain break? You might ask: “What makes you feel better or gives you comfort when you’re feeling frustrated?” You can share some restorative ideas like walking outside and breathing in the fresh air, doing some jumping jacks or a yoga pose, getting a drink of water, or visiting a favorite stuffed friend. For young children, imitate your favorite animal. Hop like a bunny or jump from limb to limb like a squirrel. For older children, listen to your favorite song or play on a musical instrument. Have your child write or draw their ideas. Keep that paper in your homework location so that when it’s needed, you can remind your child to take a look at what ideas she’s had and pick one. Daniel Goleman’s book entitled “Focus; The Hidden Driver of Excellence” recommends getting outside in nature as one of the most restorative (and just stepping outside your front door counts!). He also writes that checking email, surfing the web, or playing video games are not restorative so avoid those when you are generating brain break ideas. Yes, brain breaks are key at school too. But does your child’s teacher offer them? Even if they do, they are likely structured breaks for all students and may not serve your own child’s needs at the moment she has them. Help her learn self-management skills by figuring out what she can do in the midst of frustrating moments when she is sitting at her desk completing a worksheet or taking a test. Because mindfulness simply means becoming aware of your body and your thoughts and feelings (and holding compassion for those feelings – not judgement), it can be done anywhere. Your child could count to ten slowly while breathing deeply. Your child could tap each finger on her page individually while breathing noticing the touching sensation. She could wiggle each toe in her shoes noticing how that feels. These pauses can help her bring her focus back to her work. Brain breaks should not be long. After all, your child has work to accomplish and especially on school nights, time is limited. So allow enough time to move away and change the perspective but not so much time that your child gets involved in another activity. One to three minutes could be enough to accomplish that goal. Also, put your child in charge of the timer. You don’t want to be the one managing this break. Give your child that responsibility. Practice is important before using it. Include deep breathing in your practice. For young children, try out hot chocolate breathing or teddy bear breathing to practice this important part of the break. For older children, you can merely count to ten while breathing or exaggerate the sound of your deep breathing together. Call “brain break.” Move away from work, breathe deeply, and try out your child’s idea for one restorative practice. This practice will ensure that she is well-rehearsed and can call upon that memory when she’s feeling frustrated and taken over by her flight or fight survival brain. Notice, remind, and reinforce through reflection. After you’ve generated ideas and practiced, then notice when you see your child getting frustrated. You might say, “I notice you have a frustrated look on your face. Would a brain break help?” Then after she does a brain break and her homework is complete, reflect. “Did that help you and how did it help you?” in order to maximize her learning. For parents, teaching and promoting brain breaks with your child can serve as a helpful reminder to us. Yes, we also require brain breaks as we deal with a myriad of responsibilities and attempt to use focused attention with our child, as well as our work, as well as our household and social responsibilities. If you notice you are feeling overloaded with it all, how can you incorporate brain breaks into your own day to help you become more effective? I think I’ll take one…right now. For Educators, check out this great article on Edutopia on how to incorporate brain breaks and other focusing activities into your daily classroom routines. Goleman, D. (2013). Focus; The hidden driven of excellence. NY: Harper Collins. Kim et al. (2018). Daily micro-breaks and job performance: General work engagement as a cross-level moderator. Journal of Applied Psychology. 103 (7) 772-786. On the anniversary of the Parkland school tragedy, tweens, teens, and the parents and educators who love them are speaking up and making a difference! 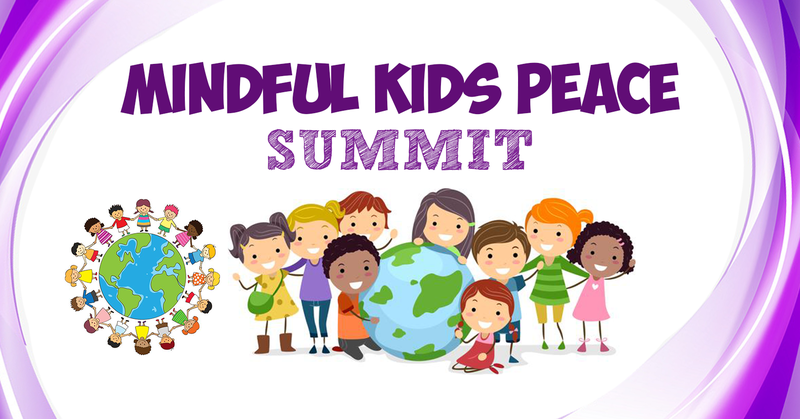 Join us for this free, online event – The Mindful Kids Peace Summit – February 11-15, bringing together over 50 expert speakers including Jennifer Miller of Confident Parents, Confident Kids with sessions for teachers and for teens and tweens covering topics such as mindfulness, peace, happiness, self-awareness, emotional intelligence and much more! We’ll talk about the value of social and emotional learning and mindfulness in schools and at home and how it can prevent the problems we worry about for our teens while promoting essential life skills and their sense of well-being. fewer students become pregnant or contract sexually transmitted diseases. increases students’ ability to experience calm. And in teachers and parents, it reduces stress and burnout. And the two – social and emotional learning and mindfulness – can fit and work together to benefit students. 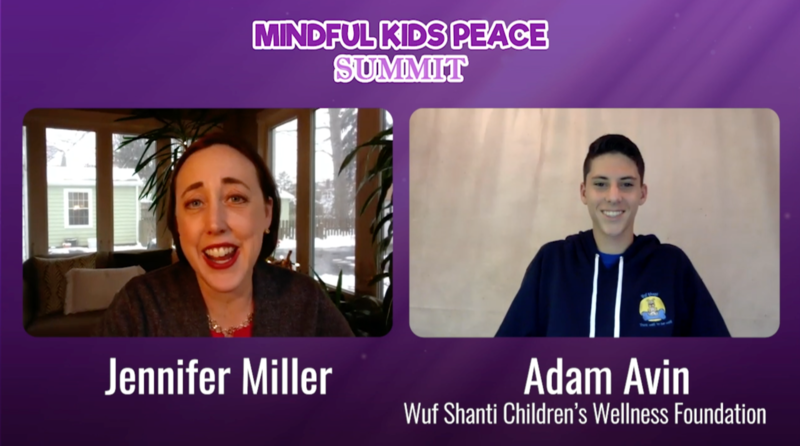 Fourteen-year-old Adam Avin of Wuf Shanti has organized this summit with Helen Maffini of the Preschool Mindfulness Summit because of his passionate commitment to helping kids and teens realize the benefits of building these essential skills while promoting kind, caring, safe schools. Watch together as a family with your tween or teen. I frequently hear parents say “I wish there was something I could do about school shootings.” Here’s something you can do. 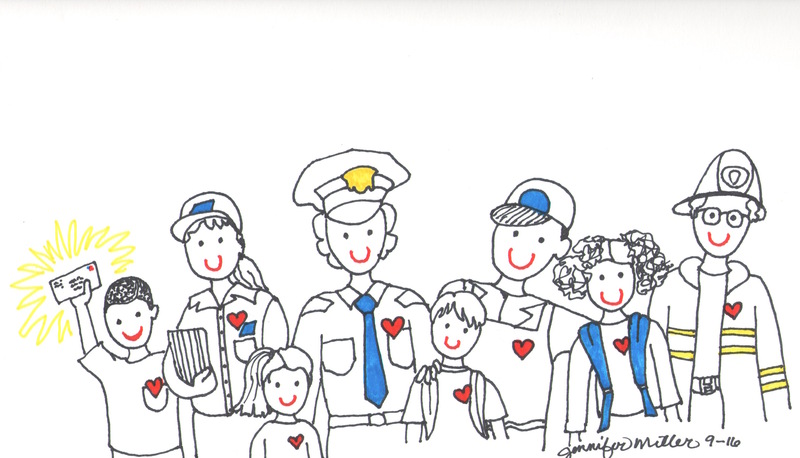 Learn, become inspired, and discover there are many simple ways you can contribute to safer schools for our children. This is a great step forward! Taylor, R., Oberle, E., Durlak, J.A., & Weissberg, R.P. (2017). Promoting Positive Youth Development Through School-Based Social and Emotional Learning Interventions: A Meta-Analysis of Follow-Up Effects. Child Development; 88 (4) July/August, 1156–1171. 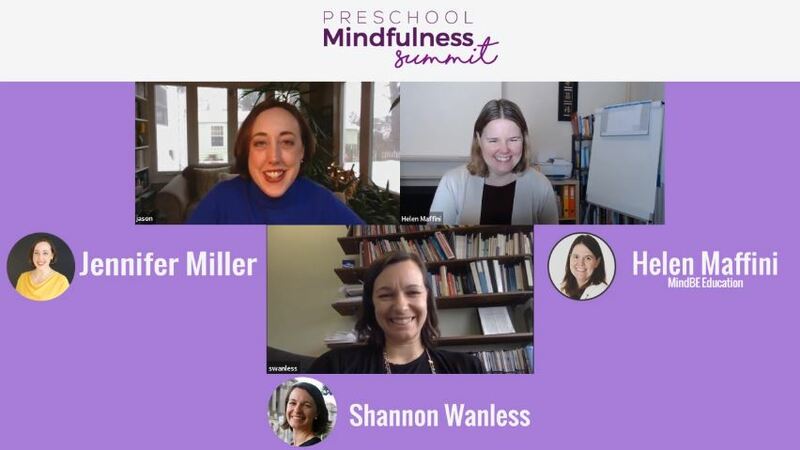 Join Shannon Wanless, child development expert, and Jennifer Miller of Confident Parents, Confident Kids for a discussion with Helen Maffini of the Preschool Mindfulness Summit about how parents and educators of young children can use mindfulness and social and emotional skill building in their everyday practices. Our interview will be made available this Thursday, January 31st. This online conference is free and underway now. And that’s the schedule ONLY FOR TODAY! The rest of the week through Friday, February 1st is packed with helpful, practical sessions. 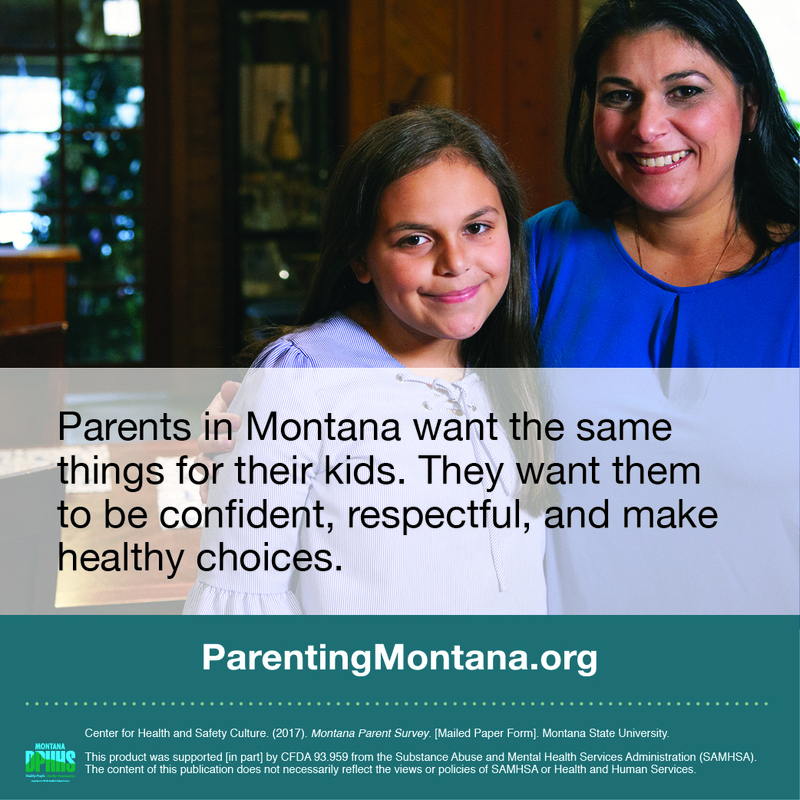 Governor Steve Bullock of Montana just announced the launch of a website entitled ParentingMontana.org that is designed to provide parents with simple to use, evidence-based tools for developing children’s social and emotional skills from preschool through high school. This unique site was developed in response to a major statewide survey asking 1,200 Montana parents exactly what challenges they faced in their roles, how they promote their children’s health and well-being, and also how they prevent unhealthy risk-taking in the teenage years. 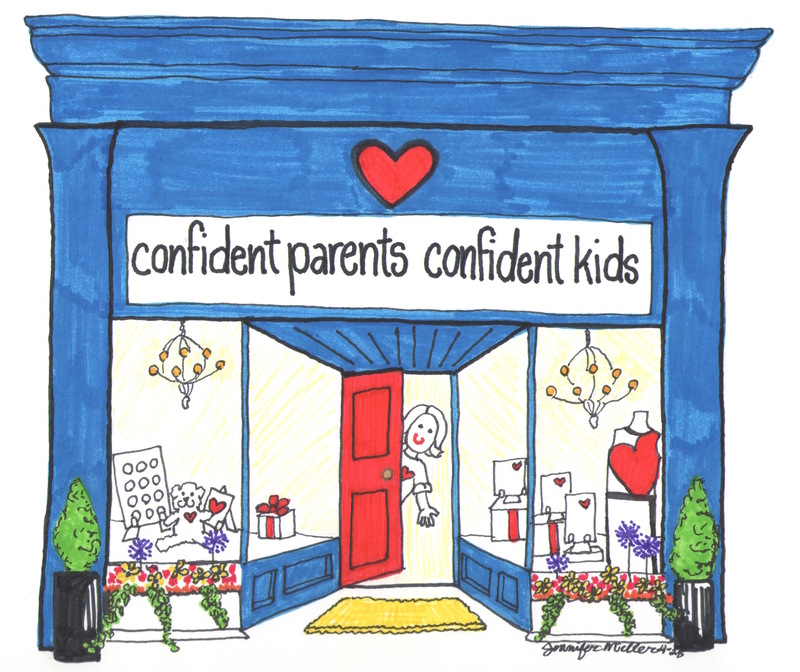 Because there was such a strong correlation between parents who used social and emotional competencies in their parenting and preventing high risk-taking in the teenage years, the tools offer parents a specific simple process for promoting social and emotional competencies at various ages and stages. These tools take parents through a simple step-by-step process seeking your children’s input first, then teaching through interactive modeling, practicing new skills, supporting those skills, and reinforcing them by noticing those positive steps. The site also contains background pieces so that parents can learn more about social and emotional development, discipline for skill building, logical consequences, intentional communication, healthy risk-taking and more. Montana television will be airing videos like the one below to make parents aware of this tremendous resource. Though the site is specifically designed for Montana parents taking into consideration their desires and needs, it serves as a national model of what’s possible when states work together to support families and their healthy development. I was so honored to work on this project! I hope you’ll check it out! Congratulations to the Montana Department of Health and Human Services, Montana State University’s Center for Health and Safety Culture and specifically Annmarie McMahill, Jay Otto, Jami Arpin, Kari Finley, Anjali Nandi and the entire team who dedicated years to this effort! It’s a joy to work with you! Please check out ParentingMontana.org!! !